Throughout the 1900s and into this century, the health and productivity of native salmon and trout has diminished along the west coast and in recent decades, a warming climate has further challenged salmon recovery. In the Rogue River basin, native fish had a really hard time accessing some of the best habitat because of various obstacles –dams on the main stem, entrenched streams disconnected from their side channels, and irrigation diversion dams on many of the tributaries. Without access to good spawning and rearing habitat or cool water refuges during low summer flows, the fate of salmon, steelhead, lamprey, and trout did not bode well. In 2005, Geos staff members decided to set an ambitious goal to give native fish a fighting chance in the face of climate change. 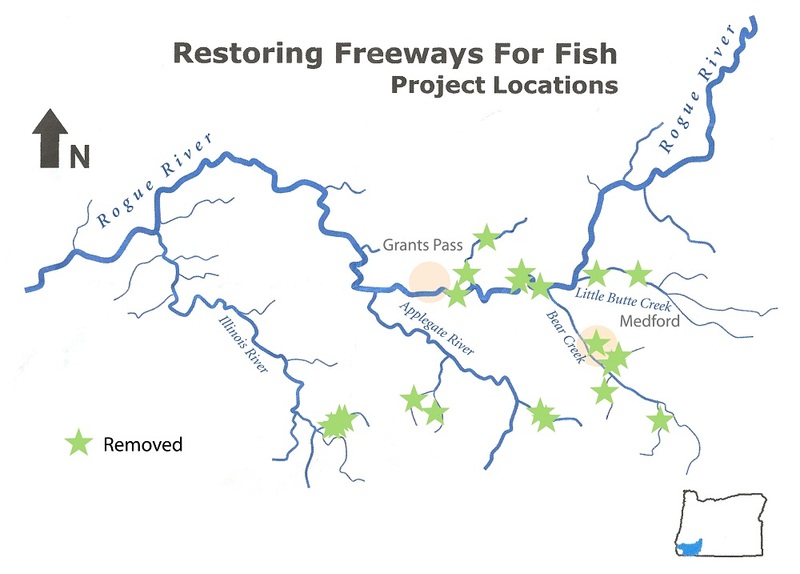 They hatched the idea of the Freeways for Fish campaign to open access to high quality habitat across the Rogue basin by removing dams and repairing fish ladders that were making it hard or impossible for fish to pass. They completed a science assessment to identify the top priority barriers to remove, set the goal at reopening 1,200 miles of habitat for native fish, and set out to get the projects done. To meet our goal, we partnered with diverse stakeholder groups in the community, along with public and private partners, including WaterWatch, the Oregon Department of Fish and Wildlife, U.S. Forest Service, River Design Group, Inc., L & S Rock Products, Inc., the Oregon Watershed Enhancement Board, and many more. Together, we removed outdated dams and diversions and restored floodplains in order to recover some of our historic stream health and help make wildlife and fish populations more resilient in the face of warmer, drier climate conditions. With the removal of two final dams in 2015, we surpassed our goal by creating access for fish to 1,299 river miles in the Rogue River system! All of this work was possible because of the support we have received from many different individuals, foundations, and government agencies. 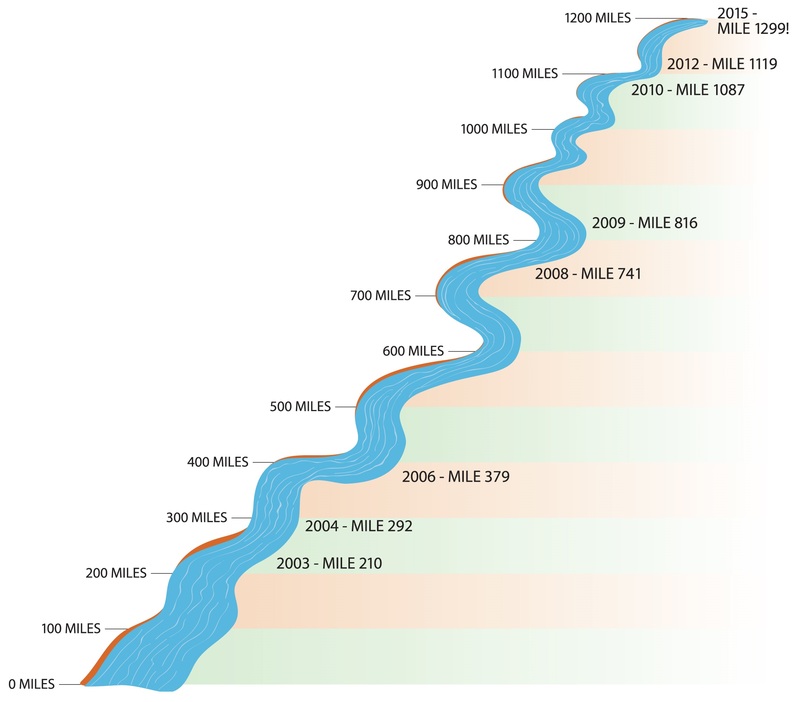 From removing several of the worst fish impediments in the state of Oregon to improving the design of water diversion structures, we’re proud to say that stream health is improving and native fish now have more room to roam in the Rogue River basin than they’ve had in a century.